Not to be confused with St Patrick's College, Maynooth. The National University of Ireland, Maynooth (NUIM; Irish: Ollscoil na hÉireann Mhá Nuad), commonly known as Maynooth University (MU), is a constituent university of the National University of Ireland in Maynooth, County Kildare, Ireland. It is Ireland's youngest university as it was founded by the Universities Act, 1997 from the secular faculties of the now separate St Patrick's College, Maynooth, which was founded in 1795. Maynooth is also the only university town in Ireland, all other universities being based within cities. With over 13,000 students enrolled, and over 900 staff from over 20 different countries, it is Ireland's smallest, yet fastest growing, university. In 2009, Maynooth University was listed as a Top500 university in the Times Higher Education-QS World University Rankings. The 2012 QS World University Rankings put MU in the 501-550 bracket worldwide, but most recently, Maynooth University was ranked in the 701–750 bracket in the 2019 QS World University Rankings. In 2008 it was named Sunday Times 'University of the Year'. In 2011, Maynooth University became the first and only institution outside of North America to be included in The Princeton Review of Best Colleges. It also has the highest proportion of university participation in Ireland of mature students (16%) and access students (22%). The university and St Patrick's College, Maynooth have a common history from 1795 to 1997. The college in Maynooth was established by the government as a college for Catholic lay and ecclesiastical students in 1795, archives of which can be found here the lay college was based from 1802 in Riverstown House on the south campus, with the opening of Clongowes Wood, the lay college which had lay trustees was closed in 1817 and it functioned solely as a Catholic seminary for almost 150 years. In 1876 the college became a constituent college of the Catholic University of Ireland, and later offered Royal University of Ireland degrees in arts and science. The Pontifical Charter was granted to the college in 1896. In 1966 the college allowed again the entry of lay students; this greatly expanded the college and essentially set the foundation stone for Maynooth University. In 1997 the Universities Act resulted in the transfer of the faculties of arts, Celtic studies, philosophy and science of the recognised college of St Patrick's College to the new university. The university has also expanded into finance and engineering since its creation in 1997. In 2007 the university added business studies, followed by law in 2008. Newly developed Eolas Building on North Campus. Any person who was a student at St Patrick's College, Maynooth, and was conferred with a National University of Ireland degree prior to the creation of the university, is legally considered a graduate of Maynooth University. In 1994, W. J. Smyth was appointed to the position of Master of St. Patrick's College Maynooth (NUI). In 1997 this position became President of MU. In 2004 W. J. Smyth was succeeded by John Hughes as president of Maynooth University. 1886 – Disestablishment of the Church of Ireland by Gladstone, Maynooth was disendowed, lay trustess left the board. 1997 – National University of Ireland, Maynooth founded from the faculties of Science, Arts and Celtic studies of Maynooth college of NUI; Outreach Campus at St. Kieran's College in Kilkenny founded. 2001 – Foundation of Dept. of Engineering. MA in Leadership course commences for Officers in the Irish Defence Forces. 2004 – Foundation of the Dept. of Media Studies, as part of the School of English, Media and Theatre Studies, by Professor Chris Morash. 2008 – Named Sunday Times University of the Year; university canteen burns down during open day. 2009 – Foundation of Department of Law with Professor Sandeep Gopalan as the first Head of Department. 2010 – Announced that Froebel College of Education will move to the University by 2013; formation of the School of Business; Professor John Hughes resigns presidency to take post at Bangor University. 2012 – Extension to The John Paul II Library is completed. The university's main campus (there is also a remote campus in Kilkenny) straddles the main Maynooth to Kilcock Road. It is divided into the North Campus and the South Campus (also referred to by staff and students as the "new" and "old" campuses respectively). The campuses were connected by means of a footbridge that crossed over the road until mid-2011. The footbridge was then decommissioned due to the construction of a library extension on the South Campus. The campuses are now connected by means of a pedestrian crossing on the Kilcock Road. The campus has four buildings for on campus accommodation, namely Rye, Village, River and Courtyard. The South Campus houses the facilities of St. Patrick's College, as well as most of the administrative offices shared between college and university. A number of MU academic departments also have their offices on the South Campus including Law, Mathematics, Music, Geography, Economics and History. The main buildings, most of which were built in the 19th century, are the Aula Maxima; St. Patrick's House (including the college chapel); the John Paul II Library (built in 1984). In December 2012 a new extension to the John Paul II library was completed. The extension is 6,000m² and accommodates 1,700 students. New, Dunboyne, Humanity and Stoyte Houses which collectively form St. Joseph's Square; Logic House and Rhetoric House. The first building to be completed on the South Campus was named after its designer, John Stoyte. Stoyte House, still a prominent presence on campus, stands in proximity to Maynooth Castle. Entrance to the Graveyard on South Campus, showing how the trees converge like a vault. Over a period of 15 years, the site at Maynooth underwent rapid construction so as to cater for the influx of new students, and the buildings which now border St. Joseph's Square (to the rear of Stoyte House) were completed by 1824. The university chapel is located on the South Campus, just off St. Joseph's Square; masses and choir services are frequently held in the chapel, as is the traditional Christmas carol service. The South Campus also houses the National Science Museum and the Russell Library. The North Campus was developed far more recently than the South Campus, in the latter half of the 20th century. Here, the main buildings are the Students' Union building, Sports Complex, Biosciences and Engineering Building, Callan Science Building (named after the inventor of the induction coil, Nicholas Callan), the Iontas building, the Arts Building, the Science Building and the John Hume Building. The Eolas building houses the department of Computer Science, the Business Incubation Centre and IVI, Hamilton and Callan Institutes, along with several teaching spaces. The student services function is also based on North Campus, and there are a number of playing fields and a sports complex, which includes a fully equipped gym and an astroturf field. The remainder of MU's academic departments as well as many research institutes such as the Institute of Microelectronics and Wireless Systems, the Hamilton Institute and the Institute of Immunology are also located on the North Campus. 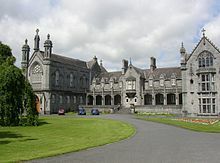 The university has also maintained a campus in Kilkenny since September 1997, based at St Kieran's College, with students enrolled in certificate, diploma and degree programmes. The university closed its Kilkenny campus in June 2018. The university is divided into three faculties: Arts, Celtic Studies and Philosophy; Science and Engineering; Social Sciences, with most students studying within one of these streams (although some cross-discipline courses are available). The faculties are further divided into various schools and departments. As of 2016, there were 1,800 students at post graduate level. Some postgraduate students also have links to the various research institutes that are based on campus. Froebel College of Education became part of Maynooth University in September 2013. A new optional subject available to first years, called critical skills. Since 2013, Froebel College of Education is situated at MU. Maynooth University has established a "Froebel Department of Early Childhood and Primary Education" and awarded Froebel College's four-year Bachelor of Education degrees, Higher Diploma in Primary Education, Master's degree in Special and Inclusive Education and Postgraduate Diploma in Arts in Special Education. The state-of-the-art Education Building opened in late September 2016. This building now hosts all students of education and all of those who are completing their Masters in Education. As a continuity of Froebel Colleges' heritage Religious Education and Theology modules are delivered by the Department and the Faculty of Theology of St Patrick's College, Maynooth (SPCM), running alongside the Degree and Masters programmes, leading to a Certificate awarded by SPCM and qualifying to teach in Catholic Schools. Admission to undergraduate study for European Union school-leavers is generally handled by the CAO (Central Applications Office), and not by MU. Applicants have to compete for university places solely on the basis of the results of their school leaving exams. Places are awarded in mid-August every year by the CAO after matching the number of places available to the academic attainments of the applicants. Qualifications are measured as "points", with specific scales for the Irish Leaving Certificate, and all other European Union school leaving results, such as the UK GCE A-level, the International Baccalaureate along with other national school leaving exams. Maynooth University is a member of Universities Ireland, The Irish Universities Association, European University Association, European Association for International Education and Eurodoc. MU is also a member of Dublin Region Higher Education Alliance, along with three other universities; TCD, UCD, DCU, and four institutes of technology; DIT, IADT, ITT and ITB. Maynooth University is also a member of the 3U Partnership with Dublin City University and the Royal College of Surgeons Ireland. The L.L.M. in International Business Law is offered as a dual degree offered in conjunction with the Catholic University of Lyon (UCLy) in France, the course is delivered in English. The Development Studies programmes of the Kimmage Development Studies Centre, began being delivered from Maynooth and accredited by the University in 2013, with the Centre moving from Kimmage Manor to Maynooth in 2018. The Diploma in Arts (Church Music) delivered in association with the National Liturgy Institute (St. Patrick's College, Maynooth) and the Dept. of Music NUI Maynooth. Any student of St Patrick's College, Maynooth prior to the passing of the Universities Act, 1997, upon whom a degree of the National University of Ireland was conferred is now legally considered to be a graduate of Maynooth University. The college continues to share its campus with Maynooth University but remains a separate legal entity with training in canon law, philosophy and theology and awards the degrees of the Pontifical University and is associated with several other colleges. In 2008, Maynooth University occupied fourth place on the Irish Sunday Times University League Table 2008, the newspaper's annual league table of Irish third-level institutions, behind TCD, UCD and UCC, having jumped three places since 2007. It was also the top institution for research income won per academic, with one of the best graduate employment records of any Irish university at almost 100 per cent. MU was also named "University of The Year 2008" in The Sunday Times University Guide (UK), beating UCD which finished second. In 2009, Maynooth University was listed as a Top500 university in the Times Higher Education-QS World University Rankings. In 2010, MU recorded the highest growth in first preference school-leaver applications in the university sector. In 2011, Maynooth University became the first and only institution outside of the United States to be included in the Princeton Review of Best Colleges. Maynooth University was recently ranked #49 in the world for one of the leading universities in the world. St Patrick's College (NUI) won the inaugural University Challenge based Irish Higher Education Quiz show on RTÉ, Challenging Times in 1991, winning again in 1992 and as MU in 1999. Maynooth University and University of Newcastle, Australia's joint robotic soccer team "Numanoids" won the soccer Standard Platform League (2-Legged Robot) RoboCup World Championship which was held in Suzhou, China from 14–20 July 2008. 2008 was Maynooth University's first year to enter the international robot competition which hosted 440 teams from 35 countries. Maynooth University first entered the Microsoft Imagine Cup in 2007. it achieved both first and third place in the Imagine Cup Ireland finals, earning participation in the world finals in Seoul, South Korea in August 2007. Team inGEST (Interactive Gesture), who developed a low-cost interactive system for teaching sign language using standard web cameras for feedback, achieved a top-six position in the finals and went on to Silicon Valley in February 2008 as part of the Imagine Cup Innovation Accelerator Program. In 2008, students tied for second place in the Microsoft Imagine Cup in the category of "Embedded Development". A total of 124 teams representing 61 countries and regions took part in 2008. In 2010 the university won the award for Best Windows Azure Application with their cloud-based medical record system. The Callan Institute (formerly Institute of Microelectronics and Wireless Systems) - Provides for research into electronic and software systems and wireless communications. Innovation Value Institute (IVI) - a joint research institute founded by Maynooth University and Intel which was "awarded to Maynooth University in 2006 over Massachusetts Institute of Technology"
Maynooth University is involved in research at the CTVR Telecommunications Research Centre, based at Trinity College Dublin. Maynooth Students' Union represents the students of Maynooth University, St. Patrick's College, Maynooth as well as students at its associated campus at St Kieran's College. There are currently over 100 clubs and societies in Maynooth University. Clubs on campus include those for rugby, Gaelic football, hurling & camogie, judo, ultimate Frisbee, Aussie Rules, badminton, swimming, kickboxing, tennis, archery, trampolining, surfing, canoeing and kayaking ('MUCK'), golf, skiing, parkour & free running, hockey, strength & fitness, aquatics, Olympic handball, snooker and pool, ultimate frisbee, chess, surf, judo, ladies soccer, rowing, self-defence and equestrian. Most of the universities clubs take part in intervarsity competition to some degree. Maynooth University also participate in an annual intervarsity sporting competition with Dublin City University, known as the 35s. The university offers a number of sport scholarships to aspiring students in Gaelic games, rugby, golf, swimming, Soccer and snooker. Maynooth is the only university in Ireland to offer scholarships in swimming. Rugby scholarships were introduced to Maynooth University in 2006 in which scholarship students are obliged to attend the rugby performance centre and to play with the university teams and Barnhall RFC. The Maynooth University Rugby Performance Centre is open to all Rugby Club members attending MU. The aim of the centre being to enhance students' prospects within the game of rugby and to continue to achieve success with the university teams. As part of the link up with Barnhall RFC, players from the youth system 16-20's are invited to take part in a summer programme. Currently there are 4 men's teams playing in Barnhall rugby club as well as the introduction of the women's Rugby scholarship there is now a women's rugby team in Barnhall. There is a colourful history of drama and theatre at Maynooth University, which can be traced back to eminent alumni such as Brian Friel (1948) and faculty such as internationally renowned playwright Frank McGuinness. Students of the university and St Patrick's College take part in various dramatic productions throughout the year, ranging from tragedy to comedy, melodrama, farce and improv. The Maynooth University Drama Society annually confers the Eugene Niland Spirit of Drama Award on a recipient who demonstrates an extraordinary level of dedication to the craft of theatre, complete with a display of integrity and honorable principles in the practice thereof. The Drama Society won Best Society at the Students Union Clubs and Socs Awards 2006 and again in 2007 and the Society's Improvisation Team won the 2009 Irish Student Drama Association Improv event. Each year the Games Society at Maynooth holds their annual gaming convention, 'Dominicon'. The event was first held in 1995 and has been run each year since then with the exception of 1999. Originally it was run during February each year but the date was eventually moved to November. The Games Society donates all profits from the convention to charity. MarsFM is the student radio station of Maynooth University and is run by the broadcasting society. The first broadcast was aired in semester one of 2013 and now has over 120 presenters. it goes on air every November until the end of the school year. Other societies include those for music, dance, musical (MAD) LGBTQ, biology, poetry, art ("Playdo"), fashion ("StyleSoc"), Feminist Soc, Tea Society, mathematics, Israel, Justice in Palestine, literature and debating ("Lit & Deb"), Maynooth Students' SVP - St Vincent de Paul Society, French language society, Spanish language society, Irish language society, (Cuallacht na Gaeilge) History Society, Afro Caribbean Society, Chinese Society, Chemistry Society, Christian Society, John Paul II Society, Psychology society as well as political societies such as Sinn Féin, Young Fine Gael, Ógra Fianna Fáil, Labour Youth and a Socialist Society (which includes Socialist Party, Socialist Workers Party and non affiliated members). The Dance Society was awarded 1st place at the 2016 Intervarsity Dance Competition at Trinity College for their lyrical performance and 2nd place for their mixed routine, involving lyrical, jazz, hip hop and Irish dance. Maynooth University annually compete for university/college society awards at a national level, which are organised by the Board of Irish College Societies (BICS). In addition to individual clubs' intervarsity competitions, Maynooth University has a standing intervarsity competition with Dublin City University (DCU) each year called the 35s, in which the two colleges compete as a whole. Each club faces their counterpart in DCU, the winning university being whichever takes most points out of the 35 available over all sports. A Christmas Carol service is held in the college chapel on an annual basis. The service is open to staff and students of the university and St Patrick's College, as well as members of the general public. Because of high demand, tickets are allocated by lottery. In 1990 the Dept. of Mathematics, at St. Patrick's College, Maynooth, initiated by Professor O'Farrell, commenced an annual walk from Dunsink Observatory, to Broombridge, Cabra, to commemorate the mathematician William Rowan Hamilton. Initially called The Quaternion Walk, now called The Hamilton Walk, takes place in October each year. The Maynooth Alumni Association, is for graduates of Maynooth University and St Patricks College, Maynooth, who wish to keep in touch with their College and also provides the means to stay in touch with friends and classmates. It hosts a number of events such as the Alumni Ball, Networking events, and publishes the Alumni magazine The Bridge. There are four different halls of residence available on campus, located in the North Campus. These are: Rye Hall, Village, River and the Courtyard Apartment Complex. In River there is an Irish language accommodation; An Ghráig. All of the apartments are open plan with a fully equipped kitchen including microwave, oven, fridge & kettle  Prices currently range from €2,660 per year for a bunk room to €5,700 a year for a single room with an ensuite bathroom. Maynooth University also offers Short Stay Accommodation for students who only require a room for a short period. 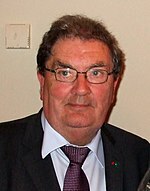 John Hume, graduate, politician, activist, Nobel laureate and winner of the Sean Mc Bride Peace Award. MP for Foyle and leader of the Social Democratic and Labour Party 1979-2001. John Sweeney (professor), ICARUS Director and lecturer in the department of Geography. Sweeney, with about 2000 other people, namely Coordinating Lead Authors, Lead Authors, Review Editors, Bureau Members, Staff of the Technical Support Units and the Secretariat contributed to the reports of the Intergovernmental Panel on Climate Change, which was awarded the Nobel Peace Prize in 2007. Former Taoiseach Bertie Ahern has been appointed as Honorary Adjunct Professor of Mediation and Conflict Intervention in the School of Business and Law. John Blake Dillon the Irish nationalist, Young Ireland member, who co -founded The Nation newspaper spent two years in Maynooth. Paddy Gormley Nationalist Member of the Northern Ireland parliament. Richard Lalor Sheil MP, and playwright, an associate of Daniel O'Connell and a founder of the Catholic Association attended the lay college in Maynooth, and strongly spoke in favour of the Maynooth Grant. Stephen Woulfe who became a barrister, and Attorney General and the first catholic to be Chief Barron of the Irish Exchequer also attended the lay college at Maynooth. Bertie Ahern, Former Taoiseach of Ireland who has been appointed as Honorary Adjunct Professor of Mediation and Conflict Intervention in the School of Business and Law. PR Consultant, RTE former Board Chair Tom Savage BD BA. Dermot Barnes-Holmes, Professor of Psychology, is the world's most prolific author in the experimental analysis of behaviour for the years 1980 - 1999, and is noted for the development of Relational Frame Theory alongside Steven C. Hayes. Sir Dominic Corrigan Bart., MD, MP, physician, first Catholic president of the Royal College of Physicians, member of the Queen's Colleges Senate, Vice-Chancellor of the Queen's University in Ireland, and Liberal MP for Dublin City was student of the lay college in the early 19th century. Mathematician and Classical scholar Pádraig de Brún was Professor of Mathematics at Maynooth prior to becoming president of UCG (NUI Galway). Sir Joseph de Courcy Laffan physician to the Duke of Kent and Duke of York attended the early lay college in Maynooth. Former Provost of Trinity College, Dublin John Hegarty holds both a BSc in Physics/Chemistry/Mathematics/Philosophy and a HDipEd from the National University of Ireland, Maynooth. Noted astronomer and physicist Susan McKenna-Lawlor is a professor of Experimental Physics. Michael O'Dwyer was nominated Chevalier dans l'ordre des Palmes académiques, by French Prime Minister François Fillon. Former president of Maynooth, and later Archbishop of Melbourne, Australia, Daniel Mannix was nominated in his adopted country as one of the 'one-hundred great Australians' of the 20th century. Gerald Molloy theologian and physicist. The Bridge: Biannual alumni magazine produced by the Alumni Association. Archivium Hibernicum: founded in 1911 is an annual historical journal published by St. Patrick's College, Maynooth, and the Dept. of Modern History, Maynooth University. The Tonic / Maynooth Advocate: newspaper titles published by the Publications Society. ^ "St. Patricks College Maynooth". www.maynoothcollege.ie. Retrieved 6 July 2015. ^ "Page Not Found". Archived from the original on 26 February 2012. Retrieved 6 July 2015. ^ "About Us- Dedicated to people, ideas and culture". www.maynoothuniversity.ie. Maynooth University. 27 November 2016. Retrieved 27 November 2016. ^ "Maynooth University Communications & Marketing Office". Retrieved 6 July 2015. ^ a b "Maynooth University Communications & Marketing Office". Retrieved 6 July 2015. ^ "Maynooth University". QS World University Rankings. Retrieved 15 November 2018. ^ a b "Irish university makes U.S. 'best' guide". UPI. Retrieved 6 July 2015. ^ a b "National University of Ireland Maynooth Becomes First and Only University Outside North America to Be Included in the Princeton Review Guide: "The Best 376 Colleges: 2012 Edition"". Marketwire. Retrieved 6 July 2015. ^ "Maynooth at a glance | Maynooth University". www.maynoothuniversity.ie. Retrieved 17 November 2016. ^ a b Herbermann, Charles, ed. (1913). "Maynooth College" . Catholic Encyclopedia. New York: Robert Appleton Company. ^ a b "Maynooth Town - Facebook". ^ President Michael D. Higgins Celebrates 75th Anniversary of NUI Maynooth Department of Sociology Press Release, NUIM website. ^ a b [First NUI Maynooth law students graduate] by Cian Hill, Irish Times, Thursday, 8 September 2011. ^ "ACEI". House of Tiles. Retrieved 1 December 2016. ^ "ICT Hub Maynooth". Archived from the original on 12 February 2015. Retrieved 18 October 2014. ^ Certificate in Catholic Religious Education and Theological Studies Archived 4 September 2017 at the Wayback Machine Chapter VII Certificate and Diploma Course Programmes in the Faculty of Theology, St. Patricks College, Maynooth. ^ "Study at Maynooth". Retrieved 6 July 2015. ^ "Universities Ireland". Retrieved 6 July 2015. ^ "Irish Universities Association - The representative body of the Heads of the seven Irish universities". Retrieved 6 July 2015. ^ "EUA". Retrieved 6 July 2015. ^ "International Education - EAIE". Retrieved 6 July 2015. ^ "Eurodoc 2002-2015 - European Council of Doctoral Candidates and Junior Researchers". Retrieved 6 July 2015. ^ "DRHEA - Dublin Region Higher Education Alliance". Archived from the original on 21 July 2011. Retrieved 6 July 2015. ^ Background to the Proposal - LLM/MIBL Archived 20 July 2013 at the Wayback Machine Catholic University of Lyon, Law Faculty. ^ "The Times - UK News, World News and Opinion". Retrieved 6 July 2015. ^ "NUI Maynooth wins Irish Sunday Times University of the year". The Times. London. 28 September 2008. Retrieved 19 May 2010. ^ "Maynooth University International Office". Retrieved 6 July 2015. ^ "Ranked #49 in the world - Maynooth University". www.maynoothuniversity.ie. ^ "Application Error - Microsoft Imagine Cup". Retrieved 6 July 2015. ^ "Research". Retrieved 6 July 2015. ^ "Irish Climate". Retrieved 6 July 2015. ^ "EDIRC/RePEc: National Institute for Regional and Spatial Analysis (NIRSA), National University of Ireland". Retrieved 6 July 2015. ^ "The Changing Landscape of the Lower Ninth Ward". The New York Times. 27 August 2010. ^ "Intel: Tablet, 2in1, Laptop, Desktop, Smartphone, Server, Embedded". Intel. Retrieved 6 July 2015. ^ "Home". www.beemune.com. Retrieved 2 December 2016. ^ "Sport Scholarships | Maynooth University". Maynoothuniversity.ie. Retrieved 2 June 2018. ^ "Mars FM: Maynooth's newest radio station". Campus.ie. 27 March 2015. Retrieved 16 November 2016. ^ "MSU | MSU Life". msulife.ie. Retrieved 1 December 2016. ^ "BICS". BICS. Retrieved 6 July 2015. ^ "BICS Awards" (PDF). bics.ie. 2015. ^ "BICS Awards 2013: The Results". BICS. Retrieved 6 July 2015. ^ Twenty Years of the Hamilton Walk by Fiacre O'Cairbre, Dept. of Mathematics, Maynooth. ^ Maynooth Alumni Association webpage. ^ "Campus Rates for the Academic Year 2016/2017". ^ "John Hume - Facts". Retrieved 6 July 2015. ^ "Maynooth group expresses its opposition to Ahern appointment". ^ "Frank McGuinness". Archived from the original on 10 November 2013. Retrieved 6 July 2015. ^ "Conscience and Conflict, A Biography of Sir Dominic Corrigan(1802-1880) by Eoin O'Brien (The Glendale Press, Dublin)" (PDF). ^ "Archivium Hibernicum". Retrieved 6 July 2015. This page was last edited on 11 April 2019, at 11:06 (UTC).